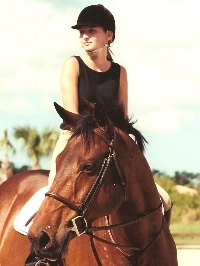 Tiffany Perelman Sherbondy grew up in the very competitive horse show world of south Florida. As a junior she trained and showed out of Wrenwood Farms, a very prestigious barn located in Naples, Florida. While at Wrenwood she traveled and showed her own horse at all of the very large "A" shows located in Palm Beach, Tampa, and Ocala. She showed in the very competitive junior hunter divisions, equitation classes, medals, and jumpers. 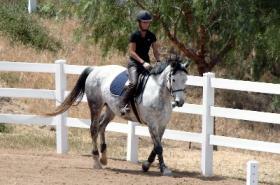 In 1999, she left Florida to attend college at Colorado State University and their very prominent equestrian studies. While attending CSU, she continued to show her own horse at many "A" shows in the area including those in Colorado, New Mexico, and Arizona. She was able to win many zone championships as a junior and adult while living there. She was even invited to compete in the Ariat Adult Medal at the Capital Challenge Horse Show as one of the top 30 qualifying adults in the country. While at CSU, she competed in the Intercollegiate Horse Show Association (IHSA) in the Open, or highest division. She was able to win many division and zone championships and qualified and competed at Nationals. She also had the privilege to take several CSU horses to the "A" shows, winning championships at The Royal in Kansas City and at the National Western Stock Show. Her final year at CSU she was also honored to be invited as 1 of 8 people in the U.S. to compete in an international competition in Scotland. She graduated from CSU in 2004 with a degree in Equine Science. After graduation, she moved to San Diego where she has been very active with many successful students on the show circuit. Degree from Colorado State University; BS in Equine Science, Industry Concentration. Certified by Colorado State University in riding instructor training in the English discipline from begining through advanced jumping level.